"This is dish is one of the most loved in my home and is asked for weekly. I hope others will enjoy as well." Mix flour, sage, garlic, thyme, salt, allspice, and paprika together in a bowl. Sprinkle about 1 tablespoon of the flour mixture over both sides of each pork chop. Heat olive oil in a large skillet over medium-high heat. Cook pork chops in hot oil until browned completely, 2 to 3 minutes more side. Remove pork chops to a platter. Cook and stir onion in the oil and drippings retained in the skillet until tender, about 3 minutes; add apple slices and continue cooking until the apple slices are tender, about 2 minutes. Pour apple juice over the onion and apple mixture; add brown sugar and remaining flour mixture and stir to dissolve. Return pork chops to the skillet. Bring the liquid to a boil, reduce heat to low, and cook at a simmer until the pork is no longer pink in the center, about 5 minutes. An instant-read thermometer inserted into the center should read 145 degrees F (63 degrees C). 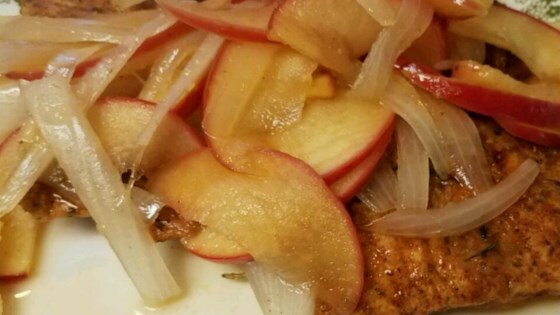 Learn how to make delicious pork chops with sweet potatoes and sauteed apples. I loved the idea of this, but the apple flavor came off a little overpowering. I think I will substitute white wine or another acid instead of apple juice next time.